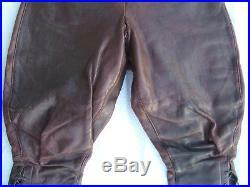 Out of a collection of vintage 1930s to 1960s British/German pilot breeches / Jodhpurs/ women riding trousers. 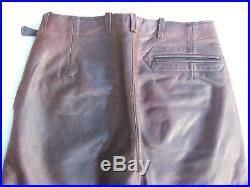 1940s new unissued orginal Afrikakorps tropical trousers / breeches (approx size w32) — 4th from bottom, ON REQUEST. 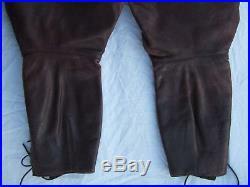 1940s German black leather’luftwaffe’breeches (size w33-w34). 3rd from bottom; IN OTHER SALE. 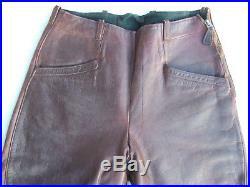 Luftwaffe 1938- 1940 original leather flight trousers BoB Era (Battle of Britain). Messerschmitt – Focke Wulf -Junkers Ju 87. 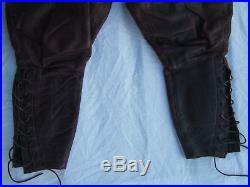 Offering an extremely rare pair of leather flight trousers in exceptionnal condition. Langlitz is 70 years old. 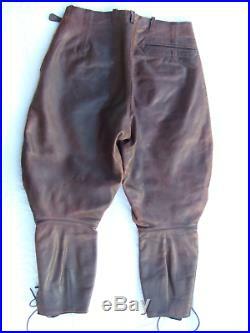 These breeches 80 years. 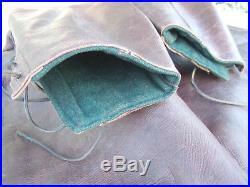 The 80 years old leather is in top condition, is thick soft and solid. Weighing 1.6 kilo. Leather is as on pictures, no issues. Nothing optically or technically disturbing. Would benefit and gain in suppleness from use. Two front pockets, one back pocket, 7 belt loops (4 cm) for a LW belt. Are fully lined green and grey (pockets). 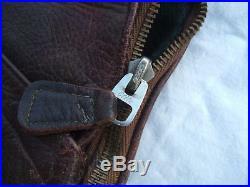 The Elite zipper on the left is functionnal, no issues. I bought this pair in 2010 with following description. Luftwaffe 1938 – 40 originale. Lederfliegerhose – Zeit um BoB (Battle of Britain). Diese Fliegerhose, die jahrelang in meiner Sammlung war, weicht nun einer Heizbaren, zur optischen Abwechslung. Passt super zur originalen Fliegerjacke der Luftwaffe. 1A Leder – keine Schwachstellen. Weiches dickes und strapazierfähiges Leder. Dicker grauer Wollstoff in den Taschen. Laschen für LW-Hosengürtel exact. 4 cm (Anmerkung:Hosengürtel der Luftwaffe sind extremst rar). Reissverschluss , Marke Elite, funktioniert gut. 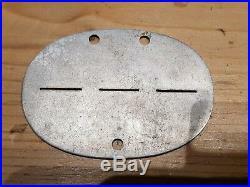 Bund ca 40 cm einfach gemessen. Diese LW- BoB – Lederfliegerhose ist sehr rar. The above description is accurate with the exception of the waist measurement (bund). Which is actually more. Like 39 cm, / waist circumference measured on the inside approx 77 cm. These must fit a w29-w30. Pictured below on top of a w30 chinos. Inseam ——————- 59 cm. Rise ————————- 36 cm. Length ———————- 89 cm. Hips ——————- 58-59 cm. Width top calf ————18,5 cm. Width hem —————–12 cm. Weight ———————- 1,6 kg. 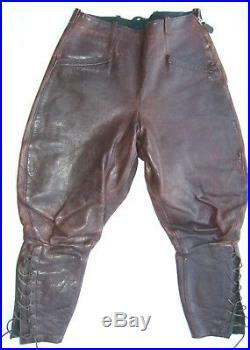 Leather Luftwaffe pilot breeches are so much rarer than the LW flight jackets. These are in a perfectly wearable condition and look great with officer boots. Hese have the ideal cut. In combination with a Hans Joachim Marseille flight jacket. 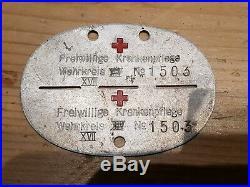 (repro from Noble House) and a so called’fliegerkopfhaube’. 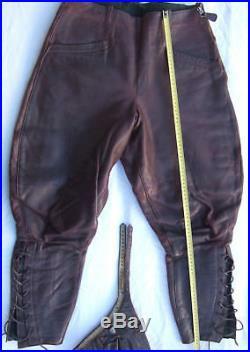 The breeches are about 2 sizes too large for the model (Fr36- w27). Trousers are late 1930s. Tusk (not included) mid 1950s. 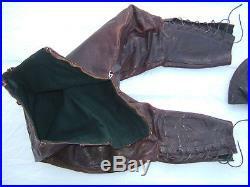 L’item « WW2 GERMAN LUFTWAFFE leather FLIGHT BREECHES 1938-1940 Battle of Britain » est en vente depuis le lundi 30 juillet 2018. Il est dans la catégorie « Collections\Militaria\Uniformes, coiffures, casques\2nde guerre mondiale 39-45″. Le vendeur est « lagardeneserendpas » et est localisé à/en PACA. Cet article peut être expédié aux pays suivants: Amérique, Europe, Asie, Australie.